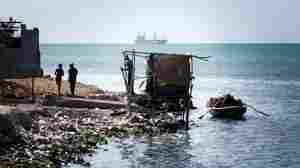 March 21, 2014  The deadly bacteria continue to sicken and kill people in Haiti. And the epidemic won't stop until the country provides basic sanitation. Many Haitians still don't even have latrines. October 23, 2013  A cholera outbreak in Mexico has been traced to the same strain that first appeared in Haiti three years ago. It has appeared in the Dominican Republic and Cuba, too. So far nearly 9,000 people have died in the four countries, and health authorities think it will spread farther in the Americas. October 9, 2013  A cholera outbreak in Haiti was likely triggered by United Nations peacekeeping forces stationed there after a 2010 earthquake. A human rights groups wants the U.N. to take responsibility for the cholera outbreak and to compensate Haitian families. July 17, 2012  Almost 90 percent of the target population – half in Port-au-Prince and the other half in a remote rural area – got fully protected against cholera. The results defy the forecasts of skeptics who said in advance of the campaign that it would be lucky to protect 60 percent of the target populations. June 18, 2012  Researchers have found two very different cholera strains in some of the first Haitians to be struck by the disease. The findings suggest that cholera germs may have been lurking undetected in Haiti for a long time. April 17, 2012  The campaign "will prevent 20,000 to 50,000 deaths among children in Haiti over the next decade," Dr. Thomas Frieden says at the end of a two-day trip to the nation. 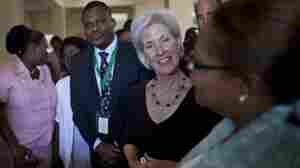 April 17, 2012  Health and Human Services Secretary Kathleen Sebelius is expected to show her support for two big vaccination initiatives in Haiti, including one against cholera. Previously, U.S. health officials were cool to the cholera pilot project . April 13, 2012  Cholera was introduced into Haiti 18 months ago. So far, more than a half-million people have gotten sick and 7,000 have died. 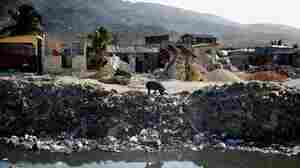 Public health authorities say the disease will linger for a long time because Haiti has the worst sanitation in the Western Hemisphere. April 12, 2012  Today, 50,000 people living in the slums of Port-au-Prince will start to get immunized against the disease. This weekend, another 50,000 villagers in the low rice-growing areas of the Artibonite River valley will get their first doses of an oral cholera vaccine. All told, though, the immunization will cover only 1 percent of the Haitian population. 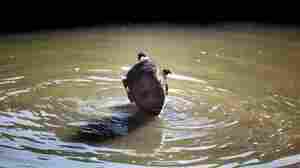 April 12, 2012  Life for most Haitians is a constant struggle for clean water. And now that cholera has invaded Haiti, safe drinking water has become Haiti's most urgent public health problem. The disease has killed more than 7,000 people since late 2010. 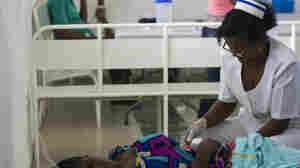 March 27, 2012  Cholera has killed nearly 7,000 Haitians since October 2010 and sickened well over a half-million. A program to vaccinate 100,000 Haitians was supposed to have kicked off by now — before the spring rains once again help spread the disease. But the campaign is bogged down in red tape. March 13, 2012  There's enough vaccine to treat the 100,000 Haitians who have signed up for it. But a government mix-up and a local radio station's incendiary report put the project on hold just a few weeks before the earthquake-ravaged nation's rainy season begins. 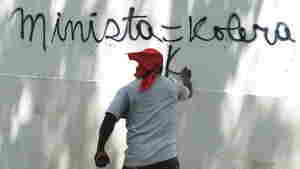 A Haitian protester in Port-au-Prince last month spray-paints a wall, equating the UN mission in Haiti (abbreviated here as MINISTA) with cholera. 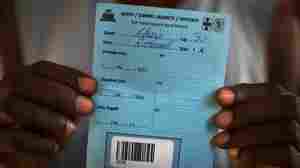 October 20, 2011  The goal of the vaccinators isn't to stop cholera in its tracks. They can't do that in Haiti with only enough vaccine for 100,000 people. The aim is to show the world that vaccination against the illness can be done. August 31, 2011  Researchers tracked the movements of cellphone users through their SIM cards in Haiti during the cholera epidemic. Their study shows that cellphone data could help doctors and others better provide relief during a disaster or epidemic. 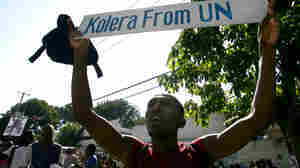 May 6, 2011  A United Nations panel finds that cholera spread quickly from a U.N. camp in the upper Artibonite River valley to waters used by tens of thousands of Haitians for bathing, washing and drinking.